RedMonk client Spiceworks released a new feature today, an RFQ system that its community can use to shop around for IT assets – you know, computers, software, and such. As ever with Spiceworks, they’re trying to improve the day-to-day of their user base, here by automating a process that would otherwise be very time consuming. I wrote up a related piece on our Spiceworks page going over some ideas for the future of IT buying. The more vendors that sign up, the better a “marketplace” it’ll be, as I get into in my piece over on the Spiceworks RedMonk page, there’s some interesting collaborative IT management (or “social IT” as some call it now-a-days) potential as well. I’d love to hear what you think: purchasing isn’t the most dashing part of IT management, but it sure is an important one. Disclosure: Spiceworks is a client. 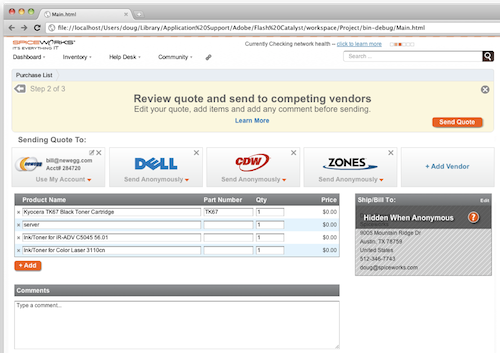 I haven't tried spiceworks but it seems interesting to try with their Request for Quote (RFQ) feature. It gives opportunity for small and mid-sized businesses (SMBs) to solicit vendor quotes for technology goods and services and other purposes.